Driven by more than just great technology. Our business has never been just about the technical results. From day one, it’s been about relationships. From our original three founders to the more than forty professionals contributing daily to our success, a shared respect for ingenuity and an unwavering sense of accountability unites us. With this simple creed, Nextrio has been fortunate to attract some of the industry’s best and brightest minds to work with inspirational clients. It all started with three IT consulting pros and a few businesses who were banging on our Tucson door before we officially launched! 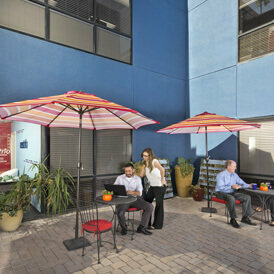 Everything doubled: clients served, staff hired, office space needed and fun produced! Our relationships with major tech manufacturers started getting attention: we hit Gold Partner level with certifications in the big infrastructure brands. Microsoft, Apple, Cisco, VMware, Google, and more — we’ve passed tough tests with them all. As our 1,000th client came onboard, we stopped to reflect on the fact that our very first client remains a valued partner still today. Moving to our new digs did more than just revitalize a forgotten midtown corridor; it brought us closer – to our colleagues, our clients and the action of the wild, wild (entrepreneurial) West. IT Professionals on our consulting team and managed services business units achieved symbiotic harmony on behalf of clients who need both big picture vision and daily operational excellence! You really can have your cake and eat it, too. To prove it, we schedule at least one Cake Day a month. As in the prior two years, we rented two entire movie theaters to take every staff member and their loved ones to the opening night of Star Wars: The Last Jedi (Episode VIII). You may call it team building; we call it “reducing the number of sudden sick days that coincide with Star Wars release dates.” Everyone called it AWESOME. We’re taking this show on the road. Now more than ever, our footprint extends throughout the entire southwestern United States, as our products, services and delivery modes bring us closer to our clients’ locations. 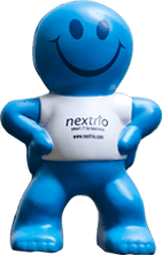 Nextrio is a good place for great people to do what they love every day. We work hard, play hard and take our roles seriously. We’re professionals — passionate about our craft and dedicated to the people we work and do business with. And we have a lot of fun along the way. When you love what you do, it shows. When you’re good at what you do, happy clients tell everyone!